2008. However, it was imperative for Sierra Club to keep its membership total above a certain threshold for both revenue generation and political lobbying purposes. MarkeTeam developed an acquisition database model. With access to a database of over 127 million households, we were able to cluster and profile households. MarkeTeam developed a model for Sierra Club and tested it over several mailings. The database list performed on average better than 40% of the current list plan, thereby allowing Sierra Club to drop the worst performing lists. To this day, the acquisition database list is in every mail plan and makes up a significant portion of the plan. Although Sierra Club had been mailing its deep lapsed audience in acquisition for several years, MarkeTeam made several improvements that significantly increased response. Sierra club had a large cohort (1 MM) of untapped warm prospect names that had been acquired in the prior twelve months. These names came to Sierra Club as action takers/petition signers through sites such as Care2, Change.org, and Upworthy. These petition signers were exclusively on coal related topics. Although Sierra Club had mailed these names in acquisition, they were mailed as a monolith and the performance metrics were such that there were better investment opportunities available to them. Initial testing revealed that there were segments that performed as well as outside lists in terms of response and average gift and these names have become a regular list in the acquisition plan. However, testing also indicated that about 60% of the names were not viable. MarkeTeam modeled the names using regression modeling as well as enhanced donor profiling. Outside models were also engaged and tested head to head against the MarkeTeam models. Results from this testing showed the top three deciles worked as well or better than outside lists and comparable to the third-party models, but at a much lower cost. The remaining names were utilized in the merge and mailed as hits against outside lists. Metrics are better than the lower lists in the mail plan. In addition to the segmentation/modeling strategy, both creative testing and online integration have been implemented. The current acquisition control to the petition signers is an Endangered Species/Wolf theme. Since the e-activist came on through coal related topics, several coal themed creative packages have been developed and tested with moderate success. MarkeTeam partnered with Sierra Club’s online agency to coordinate timing and creative testing in the online approach to this cohort. MarkeTeam introduced a coin package that provided a 40% lift over the previous control in test mode. Upon roll-out, Sierra Club had its highest responding acquisition campaign in over seven years. MarkeTeam tested a joint membership offer, with the 2nd person in the household added for ‘free’. The kit not only boosted response, but the number of donors taking the joint offer increased the number of members by an additional 10%. The offer has been incorporated into the control package. MarkeTeam tested offering donors a choice between two back-end premiums. This strategic approach provided a 17% lift in response and provided greater postal efficiencies instead of offering males and females a different premium and creating separate lots. This has also been incorporated into the control package. 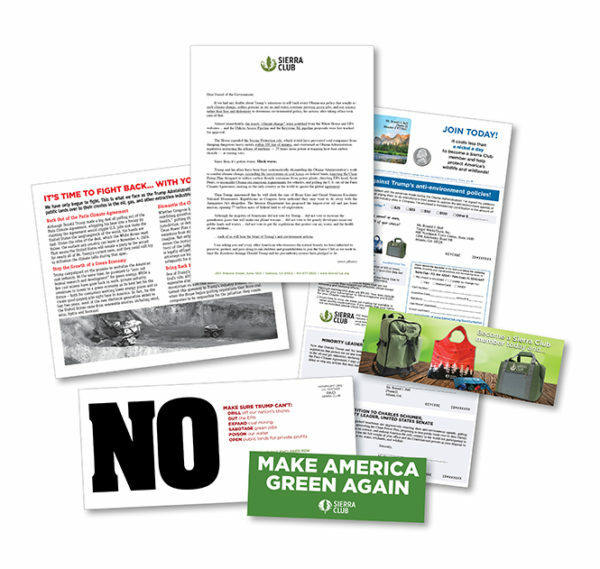 MarkeTeam analyzed Sierra Club’s lapsed audience and determined that some segments could be mailed more often (10x per year instead of 6x). Lesser performing segments remained at the 6x pulse. This strategic approach provided a lift in overall response rates. MarkeTeam implemented its proprietary segmentation tool, SmartSelect, to optimize the mailing selection and package assignment for every mailing. SmartSelect identifies individuals most likely to respond (to avoid spending money on those donors who have a low likelihood of responding), and further isolates donors who are likely to respond and maintain high-value, long-term relationships with an organization. Overall, through improved segmentation, modeling, hit strategy and new creative approaches, Sierra Club has been able to mail several hundred thousand names per drop at comparable response and gift metrics as outside lists, but at a much better net/donor since the names have no associated list cost. Also, first year retention rates are several percentage points higher than names from cold lists.